As they say, opposites attract, so it’s pretty common for there to be one spouse that’s the spender, and one that’s the saver. This can cause tons of disagreements when it comes to budgeting, saving, and planning out your financial future. Two people who are constantly arguing over the future of their money will never be able to reach their goals for financial freedom. Think about it this way...imagine you're both in a row boat, and paddling in opposite directions, you're going to get nowhere fast! That's essentially what you're doing with your money if you don't realize that you're in the same boat....you're on the same team...and you should be on the same page about your money! My husband and I are no different! However, over the past few years we’ve learned how to get on the same page about money. Not really despite our differences, but because of them! That's why I knew I had to record an interview with my husband, Daniel. 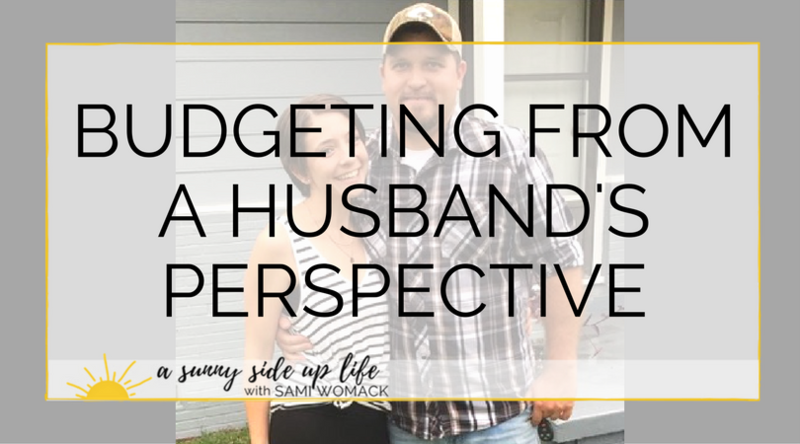 I love his perspective on budgeting, because he wasn't always on board with this lifestyle. Even though he’s a spender at heart, he realized that he’d much rather retire at a decent age than impulse buy junk every time he turned around. So, I just had to share his interview + his take on the important success factors of budgeting from his perspective. We originally did this interview to be included exclusively in my Budgeting Course. Then, as I was editing the video, and thought....this is too good to keep for only my course students! So, I decided to share a short 10 minute piece of our awesome 34 minute video here on the blog for everyone! Wanna watch the entire 34 minute interview? Join my Budgeting Course, Your Sunny Money Method today to enjoy the full length video + TONS of other amazing lessons + bonus content! One of our biggest success factors of our budget has been our written goals sheet. For the saver, it allows you to plan out your dreams years into the future, and for the spender, it allows them to be able to visualize all of those awesome things they'll one day get to experience or own. ...best of both worlds! The most important part of creating a written goals sheet is doing it together, and keeping both people's interests at heart. Remember...you're on the same team! "We don't buy things with money, we buy them with hours of our lives." Think about it this way...if you make $60,000 a year and you buy a $60,000 vehicle, then you've essentially spent an entire year of your life on a vehicle. An entire year! When you change your mindset to buying things with time instead of money, that's when your entire world will change. Once you realize that life is too short to spend it chasing frivolous things, and that if you're going to spend time away from each other each day that you'd better have something to show for it! Remember my boat metaphor from earlier? When you're married you're in the same boat! Although each spouse might get their own spending money...there really isn't any "my money and your money". You share a life, therefore you share money. ...and why would you want it to be any different? Maybe you're just too different to agree on money (been there! ), well I'll be honest with you, there's probably more of a communication problem than there is a money problem. I won't go too far into that because I'm no marriage expert, but I will tell you from experience that you're never going to be truly financially successful without both of you rowing your boat in the same direction! Stop trying to one-up each other, stop trying to keep score, stop hurting each other. You're drilling holes into a boat that you're also riding in! Your spouse might drown, but you'll drown too...and so will your marriage! NEED SOME HELP GETTING SERIOUS ABOUT YOUR BUDGET? ...that's where I come in! "Children do what feels good, adults devise a plan and stick to it." Being patient is probably the hardest part of all of this, but it's so worth it. One of things that taught us how to be patient was the feeling that we got when we finally held the title to our truck in our hands after 7 long years of paying it off. In that moment we realized that you truly don't own something until your name is on the title. Yeah, it's hard to be patient, but it's also hard to work for 7 years to pay for a truck that isn't really even yours, plus the fact that we over paid for it in the first place, and then they tacked on interest! ...never mind, I think we'll just save for a few years instead, thanks! How does it feel to get to the end of the year and wonder where all of your money went? ...pretty bad, right? Now multiple that by 60 and imagine how it will feel to get to the end of your life and have nothing to show for it! Nothing to show for late nights at work, the sore back, and the canceled weekend plans....nothing! Now, I'm a big fan of working hard, but I'm what I'm not a big fan of is working hard and having nothing but debt and tired feet to show for it! When you set goals and work towards them suddenly every day at work doesn't seem quite so bad. Every hour is actually for a purpose. Every year that passes actually has accomplished goals to show for it. There's finally a light at the end of your tunnel...and for once it's not an oncoming train! Want to talk about something you "deserve"? Retiring without a care in the world is one of those things that you deserve as a reward for your hard work. Retirement is something that sometimes gets pushed to the wayside and is left as an afterthought until it's almost too late. The last thing you want to do is to continue to work long into the years that you should be pursuing hobbies, chasing grand kids, and traveling. The crazy part is that the younger you start to think about retirement, the less money it'll cost you. You're never too young to start saving and investing. A man's pride shouldn't stop and start with how his truck looks or what kind of clothes he wears. A real man knows that true financial success is being able to promise his family a secure future, and not just a pile of debt. When you learn to be patient enough to save and pay cash for things, you loose that child throwing a tantrum syndrome. It's not about what your friends think, or what random strangers at a stop light think...it's about what your spouse and kids think. The true essence of manliness is about taking care of your family. Have some pride in your family. Have some pride in your savings account. Have some pride in your future. Usually there are people (or bloggers) in your life that try to give you great advice, but you're too stubborn to listen. One of the best pieces of advice is to actually take people's advice! If you find someone who has actually been successful with money...then learn from them! Let them do most of the hard work for you, and simply learn from their shortened lesson that they're trying to teach you! my Full Budgeting Course, Your Sunny Money Method! "My absolute FAVORITE part of the course (Your Sunny Money Method) is the interview with her husband. This interview is in the bonus material. I would honestly pay the cost of this course just for that interview. I took a full page of notes. They talk about getting on the same page, priorities, spender vs. saver, aligning your goals, and more. I told Sami she should create a separate mini-course with her husband. I think I could do an entire course review just on that interview alone." Save this pin to your favorite Pinterest Board!